Does your dog or cat come running when they hear food hit their bowl? If so, that’s probably not too remarkable; after all, when our pets are in their prime we take their faculties for granted, even when they’re missing a leg! Wyatt romps in the desert. But what happens if one day you put that food bowl down and nothing happens? Chances are, that day will arrive for many of us who are lucky enough to care for a senior dog or cat. Hearing loss is often part of a pet’s aging process; are you ready? Wyatt snoozes on the couch. Since Tripawds founder Jerry only lived to age 10, we never had the chance to experience old age with him, our first dog. 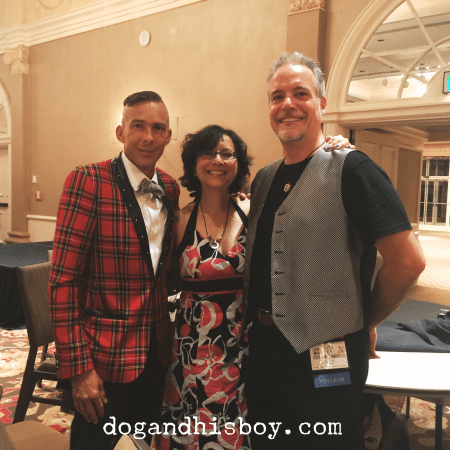 We lived in blissful ignorance about how deaf animals cope, until this year’s Blog Paws conference, when we were lucky enough to chat with Bernard of Dog and His Boy. Bernard looking smashing at Blog Paws! What is difficult about using sign language with pets, is overcoming our laziness as human beings. Those of us with the gift of hearing habitually rely on the spoken word to convey everything, even to our pets, who miraculously often manage to usually figure out what we’re saying to them. Jim uses hand signals with Wyatt. 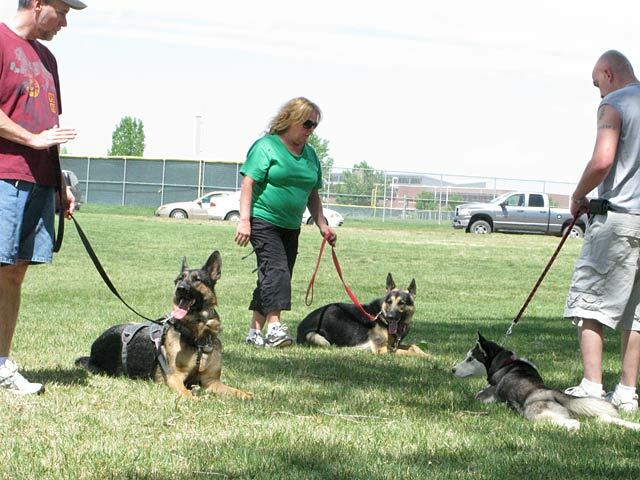 Despite the many awesome dog trainers who encourage using hand signals with our dogs so we can communicate from a distance, we usually revert back to verbal commands and cues as soon as our dog is within a few feet of us. Meeting Bernard was a real eye opener for us, and we hope that his message resonates with you too. We all need to stop speaking, and start signing to help make our senior pets lives as great as possible. Cat Channel: How Do We Train Our Deaf Cat? 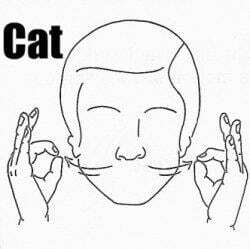 Have you ever lived with a deaf dog or cat? We would love to hear your experience! Share in the comments below. Thanks! Oh this makes total sense! That’s why my girls will respond to my “stay” command so much better if I include my hand in the “stop” position. I’m excited to read more and learn so I can teach my girls. I’m thinking that signing would bring a whole level of connecting on their level. Maybe instead of playing within ear-shot, they’ll play within line-of-sight. Seems to me that would be so much safer. Hmmm . . . the wheels are turning. Thanks! 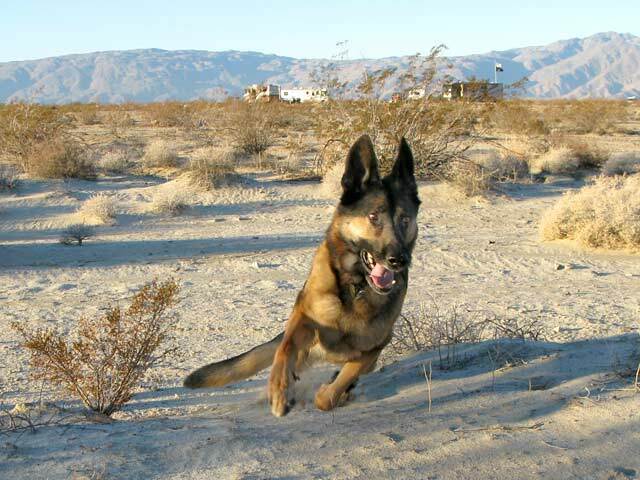 First I have to say that the photo of Wyatt running in the desert is a fabulous action shot! Thank you for bringing this to our attention. Bernard is providing a fabulous service as deaf dogs and cats can live full, healthy lives. There are things I can learn from this blog. Thank you! Sally that is a wonderful suggestion, thank you! We will definitely keep that in mind as Wyatt grows older. What a wonderful man Bernard is to make such a compassionate commitment Bernard has made to our fur friends. Thanks for bringing this wonderful man to our attention and the mission he is on to help dogs and cats who can no longer hear…or never could. And yes, her looks very dapper in his “pawty” attire…as do our two leaders!! I have had the privilege of being with dogs into their senior years as they lose their hearing. Not that this is “signing”by any stretchof the imagination, but the one thing I ALWAYS made sure was that they would know when I was “saying” “GOOD GIRL!” or “GOOD BOY!” I would always clap my hands and tell them what good boy/ girl they were…and often do it crouching by their side. That way,as theeir hearing faded, if they saw my hands in a “clapping position” and I crouched down to nuzzle them..they KNEW they were being “praised”…and usually for just “being”! A d it was a treat to watch how laser focused Wyatt was on Jim at the tripawd lawty. Jim used his energy and his hand signals in a way that Wyatt responded so willingly…and with such trust. What Bernard is doing is absolutely fascinating and I look forward to supporting his efforts. Kind words for a kind guy!